Honeycutt chairs date back to 1990, thanks to a generous endowment gift from the Community Foundation of Greater Atlanta in honor of oncology nurse, Edith F. Honeycutt, 39N, who was also the private nurse to Coca-Cola Magnate Robert Woodruff and his family. 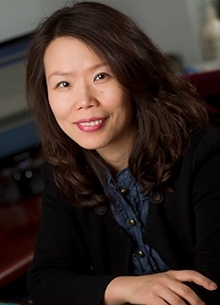 "We are so proud of Dr. Song and the impressive research program she has developed in palliative and end-of-life care," says Linda McCauley, PhD, RN, professor and dean of Emory's Nell Hodgson Woodruff School of Nursing. "She is nationally and internationally recognized in the areas of palliative and end-of-life care for her work focused on improving the quality of life for patients with serious, chronic illness including kidney and lung disease with special attention to minority populations." Dr. Song joined the School of Nursing faculty in 2016 as Professor and Director of our Center for Nursing Excellence in Palliative Care. In leading the School of Nursing's Center for Nursing Excellence in Palliative Care, including the Fuld Palliative Care Fellowship program, Song is helping to educate the next generation of palliative care providers. She serves as a mentor to many pre- and post-doctoral trainees and as well as junior faculty. Song's scholarship on end-of-life communication, decision making, symptom management, and caregiver support has been consistently funded by both public and private organizations. She was recently awarded two 5-year, $6.4 million total, National Institutes of Health R01 grants. The first study aims is to test the effectiveness of her SPIRIT (Sharing Patient's Illness Representations to Increase Trust) advance care planning intervention for seriously-ill dialysis patients when implemented by dialysis care providers across four states. The second study is focused on developing and testing the SPIRIT intervention with family caregivers or surrogate decision-makers of patients with mild Alzheimer's Disease. The intervention promotes early, open, and honest end-of-life care discussions between patients and their surrogates. To date, Song has served as Principal Investigator on 13 grants, including 5 R01s, 1 R21, and 7 university or private foundation-supported grants, totaling more than $11 million. Her work has been published in more than 71 internationally renowned, peer-reviewed journals in nursing, palliative care, and nephrology. This included 35 as first or corresponding author.